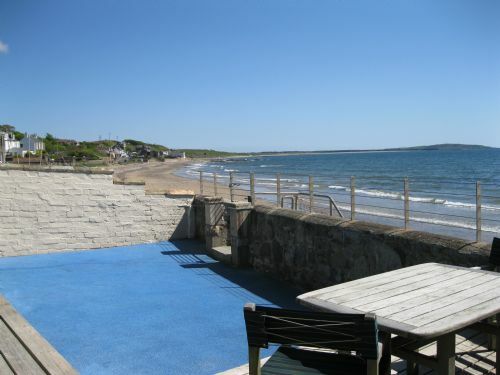 Stunning contemporary BEACH FRONT ground floor apartment overlooking Lower Largo's long sandy beach with direct access down steps from the private child friendly patio. Cleverly designed with an open plan layout to maximise the wonderful sea views the apartment is tastefully modernised to provide all the comforts you would need for a relaxing holiday including BROADBAND internet access and Sky TV. Recently fitted in lounge area is a wood burning stove.The master bedroom has an en-suite shower room and there is a second family bathroom. This apartment is an exceptional bolt hole for those seeking a quiet romantic break with pubs/restaurants within a short stroll, and in turn suitable for families with small children. Kitchen - superb quality kitchen with all mod cons including dishwasher, gas hob, electric oven, microwave etc. 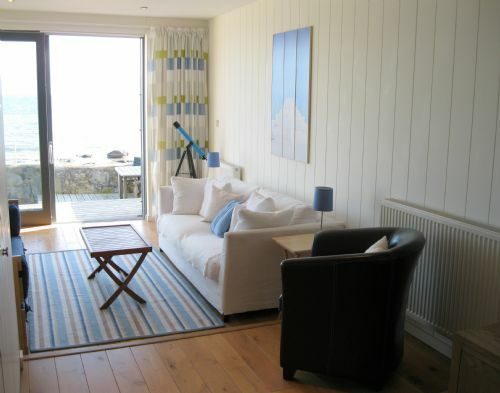 Sitting Room - comfy seating, stunning sea views from floor to ceiling patio doors which lead onto private patio, large flat screen tv with sky tv (basic channels). New fitted in 2018 is a wood burning stove to keep cosy on those cold winter nights. Outside - accessed via the sitting room or master bedroom is a private patio overlooking the sea with direct beach access through a gate and down some steps - mostly laid with a child friendly surface - outside shower for hosing down when coming off the beach, patio furniture. First visit this year.Really lovely weather & walks & coastal path & views. The flat is as good as ever as are the wonderful views. Lovely clean and comfortable apartment with an amazing vista. We have enjoyed exploring Fife - a nice part of the world. A beautiful, modern apartment with everything you could want and need for a holiday! The view is breathtaking no matter the weather and the clever design of the apartment means you can always appreciate it! The beach is easy to access and you can watch both the sunrise and sunset in comfort! Perfection! Shorts, sunglasses and sun hat weather for 2 weeks! Booked again for next year already. Don't want to go home. Thank you for the refund of the security deposit. We had a brilliant week, weather was very kind to us and No 56 is just the business. We will be back probably at Easter next year. "We would like to thank you for the lovely stay in 56 Main Street - the accommodation is indeed very nice and comfortable - we won’t hesitate to visit your website again for our next vacation"
"Superb place - congratulations - easily one of the best smaller holiday homes in Scotland. The effort really shows. Will definitely return. Please pass on our thanks to the owners, the layout and specifications of the house are fantastic and the location is perfect, thanks also the cleaner, the house was immaculate throughout. Just wanted to thank you for giving us the opportunity to stay at 56 Main St, Lower Largo. It’s a beautiful property and we had a wonderful visit and hope we can return soon. Just a quick note to say how impressed we were with No. 56 Main Street Lower Largo - the information and photos on your website are excellent but we were even more impressed with the place when we arrived! It is very well furnished and well equipped and made for an excellent family holiday with young children, who found the beach the best thing ever! 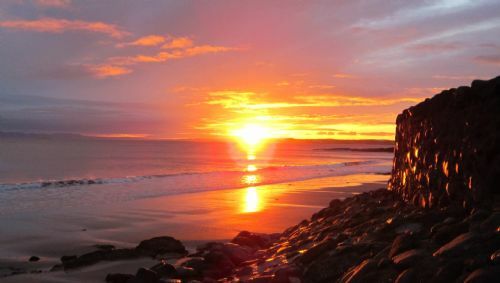 (We have beaches within 15 minute drive from home but the Fife Coast is worlds apart!). Sitting there listening to the sea in the evenings was so peaceful and relaxing.